1. Delineation of Groundwater Potential Zones in Jaisamand Basin of Udaipur District, by P.K Singh.- 2. Spatial and Temporal Variations of Groundwater Level: A Case Study of Wainganga Sub-basin Nagpur, India, by Chandan Kumar Singh.- 3. Spatio-temporal Variation and Trend Analysis of Groundwater Level in Raipur City, Chhattisgarh, by Sumant Kumar.- 4. Spatio-Temporal Relationship Linking Land Use/Land Cover with Groundwater Level, by Vishwanatha Bhat and Prajwal M.- 5. Groundwater System Modelling and Sensitivity of Groundwater Level Prediction in Indo-Gangatic Alluvia Plains, by Raj Mohan Singh.- 6. Assessing Groundwater Aquifer Vulnerability Using GIS-Based DRASTIC Model Coupling with Hydrochemical Parameters in Granitic Terrain From Southern India by N C Mondal.- 7. An Innovative Technology for Recharging Alluvial Aquifers, by Sujata Ray.- 8. Development of Groundwater Recharge Plan for Bemetara District of Chhattisgarh Using GIS, by M K Tripathi.- 9. Paleochannel Recharge Sources in the Central Godavari Delta, A.P., India By R. Satyaji Rao Yellamelli.- 10. Change of Land Use/Land Cover on Groundwater Recharge in Malaprabha Catchment, Belagavi, Karnataka, India, by Purandara B. K.- 11. Causes and Sources of Groundwater Pollution: A Case Study of Nagpur City, India, by Sahajpreet Kaur Garewal.- 12. Modeling Leachate Migration- Pramada S K.- 13. Assessment of Groundwater Quality and Identification of Hydrogeochemical Process in Hard Rock Terrain by K. Rama Mohan.- 14. Spatial and Temporal Nitrate Transport in Deep Heterogeneous Vadose Zone of India’s Alluvial Plain, by Jahageer Tomar.- 15. Riverbank Filtration as a Sustainable Solution for Drinking Water Quality and Quantity Problems in Haridwar, Uttarakhand, by Shashi Poonam Indwar.- 16. 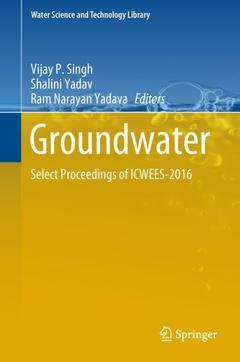 A Study of the Characteristics of Groundwater Solute Transport Parameters, by Biswajit Chakravorty.- 17. Prioritization for Management of Groundwater Quality Related Problems of Rajsamand District of Rajasthan, by K K Yadav.- 18. Effect of Biochar Amendment on Nitrate Leaching in Two Soil Types of India, by Anil K. Kanthle.- 19. Seasonal Variation of Groundwater Quality in and Around Laharpur Reservoir Bhopal by Neha Nigam.